While next-gen technology like augmented and virtual reality are becoming increasingly common in devices such as the Oculus Rift and Microsoft HoloLens, the tech is often forgotten about as a tool for warfighters. There has been increased interest in using mixed reality to simulate training, enhance command and control, and improve the effectiveness of warfighters on the battlefield. It is thought that putting mission relevant battlefield data, such as satellite imagery or body-worn sensor information, into an immersive environment will allow warfighters to retrieve, collaborate and make decisions more effectively than traditional methods. Researchers at RDECOM’s Army Research Laboratory, the Army’s corporate research laboratory (ARL), in collaboration with the University of Minnesota and the U.S. Army’s Institute for Creative Technologies at the University of Southern California, have set out to change this. “Our survey of the existing literature determined that new methods and metrics are essential to ensure that future basic and applied research can efficiently and accurately assess performance differences between immersive technologies and traditional 2-D systems,” said Dr. Mark Dennison, research psychologist in ARL’s Battlefield Information Processing Branch stationed at ARL West in Playa Vista, California. “In this paper, we suggest a paradigm shift away from simply comparing non-immersive and immersive systems on similar tasks, and instead meticulously breaking down complex decision-making into component processes that can be more accurately modeled and compared across disparate display types,” said Dennison. “For example, when studying the planning of a tactical operation, such as the breach and clear of a hostile building, the same spatial information must be present in the 2D and VR experimental conditions to allow for precise quantitative comparisons. Currently, AURORA-MR is being used for collaborative immersive analytics research in Maryland at ARL headquarters at the Adelphi Laboratory Center and Aberdeen Proving Ground, in California at ARL West and the ICT’s Mixed Reality Lab, and at the University of Minnesota. According to the team, this research will enable the Soldier to understand when visualizing and interacting with critical battlefield information might be best done in an immersive system, or in collaboration with others using traditional systems. 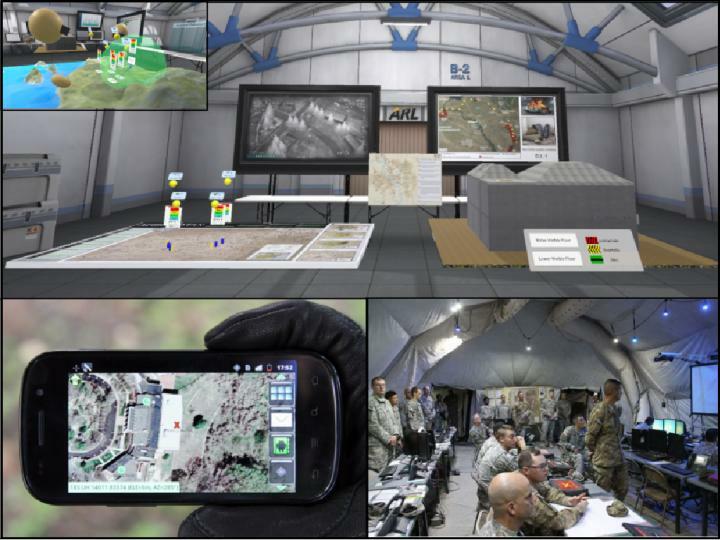 “Through virtualization of some or all elements of the Tactical Operations Center, commanders and intelligence analysts can communicate and collaborate without the constraints of a physical building and with a reduced footprint to enemy intelligence, surveillance and reconnaissance, or ISR,” Dennison said.